As posted by the Etobicoke Guardian, April 25, 2013. Its location is a mystery to many. But its members would like its secret to become better known. 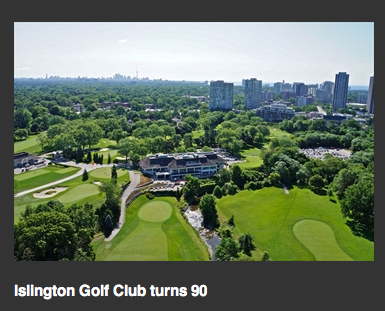 Islington Golf Club celebrates its 90th anniversary this Sunday with an open house from 1 to 3 p.m. at the Riverbank Drive club tucked off Islington Avenue just north of Dundas Street West. Tour the facility, meet staff and members, sample the club’s cuisine and join a complimentary spring swing clinic by club pro Phil Kavanagh. A draw will award one attendee a year’s trial membership valued at $5,000. Tracing the Mimico Creek, the 18-hole, par 72 championship course retains many of world renowned golf course architect Stanley Thompson’s original elements, a challenge for even the most experienced golfer with water hazards in play on 12 of the 18 holes, Dave Fox, general manager said. Its 585 members appreciate the absence of a tee time on the course, Fox said, which is a 30 minutes’ drive from downtown Toronto. Its club house was renovated in 2011. A year earlier, the club partnered with Golf Canada to host a practice facility for the 2010 RBC Canadian Open, played at St. George’s Golf and Country Club. In 2009, 60-year plus member John Tyers and Toronto police’s 22 Division launched the then-newest chapter of the National Junior Golf Academy with founder Kingsley Rowe for 16 youth from the Mabelle highrise neighbourhood around Islington and Dundas. The free, six-week program taught kids every Thursday night at Islington Junior Middle School and at Driftwood Community Centre the fundamentals of golf and its discipline, including honesty, integrity, respect for self and others, punctuality, decorum and sportsmanship. “It elevates their lives, exposes them to a different lifestyle, something they can strive for, and gives them goals. It works,” Tyers said at the time. A celebrity classic golf tournament every May teams former athletes, Olympians, singers and actors with members in foursomes with funds raised donated to Sleeping Children Around the World. The charity founded by the late Murray Dryden, father of NHL stars Ken and Dave, has provided more than one million bedkits consisting of a mat or mattress, pillow, blanket, mosquito net, outfit of clothing and school supplies to children in 33 countries since its inception in 1970. Last year, the club launched a limited time, one-year trial membership for $5,000, which returns this spring. “I think more clubs are going that route. It’s an opportunity for someone to kick the tires and test drive it for a year,” Fox said. Doug Eaton joined Islington Golf Club as a caddy at age nine in 1969. He joined as a junior member in 1972 and has played the course ever since. Eaton’s father, John and mother Shirley both played, as did the couple’s four children. In fact, Shirley and daughter, Cathy, are the club’s only mother-daughter club champions, Eaton said. Eaton calls the club “an oasis” and marvels that more people don’t know where it is. “It’s such a great spot. People don’t know where it is and that’s what shocks me the most. The only major artery where you can see it is Kipling north of Burnhamthorpe where you can see the 15th hole. It’s so secluded,” Eaton said. Islington Golf Club celebrates its 90th anniversary with an open house this Sunday from 1-3 p.m.
* 1913: the club was the vision of entrepreneurs Col. Bill Rogers, E.H.A. Watson, Riverdale Collegiate principal and local realtor Mr. Chadwick. As published on the St. Andrew's Presbyterian Church website. Click on the March 17, 2013 sermon. Ken Graham at St. Andrew's Presbyterian Church in Fergus, ON on March 17, 2013. Click graphic or link above for the video. Clarence DeYoung believes in giving back to his community. What makes Clarence special is he sees the world as his community, and he wants to make it a better place. For more than a quarter century, Clarence has organized efforts to send essential supplies to various countries in Africa and Asia, while at the same time, working for various causes in his home community of Pomquet, N.S. “I certainly do enjoy doing volunteer work and I’ve been doing that since 1989, with various organizations. I seem to have the need to give,” says Clarence. For most of that time, Clarence has been part of a group called Sleeping Children Around the World, which distributes bed kits to children in Asia and Africa. His latest project started after Clarence and his wife hosted a mature student from Ghana, who had connections to an orphanage, school, and hospital. “Through those conversations, the seed ended up being planted that, maybe we should think about putting a container together to help the kids in Ghana,” says Clarence. Family, friends and neighbours help collect and sort donations from around the region. Tiffany Hallett says her uncle Clarence has always been a role model for helping those in need, whether at home or abroad. Raymond DeCoste says Clarence’s giving nature is contagious. “It’s just so meaningful, anything he does. You couldn’t say no to him,” says Raymond. 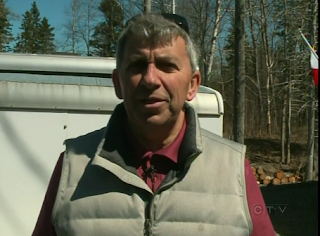 Congratulations to Clarence DeYoung, our Maritimer of the Week! If you know someone deserving of our Maritimer of the Week award, we want to hear about it. It doesn't matter how old they are, the nature of the "good deed" they've done, or what part of the region they live in – we want your ideas! Maritimer of the Week, P.O. Box 1653, Halifax, N.S. 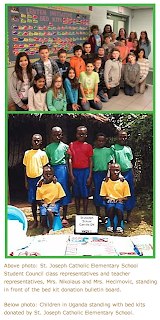 St. Joseph School in Oakville recently participated in their annual Lenten initiative to benefit children in under-developed countries. Every year, during the season of Lent, St. Joseph Catholic Elementary School in Oakville runs a fundraiser in support of Sleeping Children Around the World, an organization that purchases bed kits for children in under-developed countries around the world. The annual Lenten initiative provides students and staff at St. Joseph School with an opportunity to contribute towards purchasing a bed kit on behalf of their class. Students may also purchase an entire bed kit on behalf of their family. With each donation of $35, a child receives a foam mattress to sleep on, a pillow, sheet, blanket, mosquito net, school clothing, towel, backpack and school supplies. This year, the students and staff raised enough money to purchase 140 bed kits! For a school community of only 370 students, this is a wonderful success! Click graphic to see larger size. As published in District 22 Retired Teachers of Ontario newsletter, April 13, 2013. Children Around the World (SCAW) it was important for me to learn these translations. Since retiring in 1999 from the TDSB after 34 years of teaching, I have been fortunate to join 6 SCAW distribution teams in India, The Philippines, Uganda and Bangladesh. The goal of the charity is to provide “the comfort of a good night’s sleep” to children in developing countries by distributing bedding, mosquito nets, clothing and school supplies in a parcel known as a “bedkit”. Begun in 1970 by Murray and Margaret Dryden, parents of NHL stars Dave and Ken and daughter Judy, Sleeping Children Around the World has so far provided 1,230,330 bedkits to children in 34 countries. Each year another 72,000 kits are distributed by SCAW volunteers. ￼￼￼￼￼￼￼￼￼￼￼￼￼￼￼￼￼Donors purchase a kit for $35, receive a tax receipt and a photo of the sponsored child. Many donations are gifts to friends or relatives who then receive the photo. Christmas, Hannakah, birthday, retirement and “in memoriam” gifts are popular. What makes Sleeping Children Around the World unique? It truly is “the 100% charity” since all administrative costs are covered by a legacy fund created by Murray and Margaret. Volunteers process all donations in the family’s Etobicoke home which was donated to the charity and travellers pay all their own expenses. Overseas volunteers from organizations such as Rotary and Kiwanis source all items locally, often from cottage industries, which encourages the local economy. These groups choose the recipients with help from local schools and social agencies. The children are 6 - 12 years old, attending classes and have at least one parent to ensure that the bedkit contents are used well. The role of the travelling volunteer is to ensure that all recipients meet the guidelines of the charity. They take photographs to be sent to the donors and personally hand over the bedkit to each child. A careful check is made to ensure that only children identified by the overseas group receives this “gift of love from Canada”. The work is quite physically demanding, especially in the hot climates where most of the kits are distributed. But the rewards are great. Why have I enjoyed being a Sleeping Children Around the World volunteer? In The Philippines, “Salamat Po”, “Thank you very much”, spoken by a shy child or a grateful parent conveys the importance of this gift. My years of teaching brought much satisfaction and this volunteer activity is a continuation of that enjoyment. Sleeping Children Around the World is grateful for a grant of $10,000 from the provincial RTO office in 2012. That gift will result in 285 more children receiving “the gift of love”. For more information about The 100% Charity, go to the website www.scaw.org. I gave a presentation today to an after school group of children at Christ Church, Anglican in Markdale. Here are 2 photos from there. The first shows the Rev'd Yvonne Summerfield, her helpers and the children, with me in the background. The second photo is of some of the kids under the mosquito net! All told there were 10 people at the presentation. Apparently the number of kids fluctuates from day to day, and unfortunately, there weren't very many there today. The children did enjoy learning about SCAW, and asked quite a lot of questions. As posted on the Stratford Beacon Herald website, April 5, 2013. 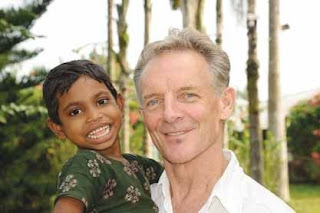 After five trips to south Asia to help some of the poorest children on the planet, Doug MacDougald is switching continents as he continues his charity work abroad. The Stratford man will be travelling to Togo, Africa next week to volunteer with Sleeping Children Around the World, a Canadian-based charity that distributes bedkits to young people in impoverished nations around the world. The organization was founded on the idea that every child deserves a peaceful night’s sleep. He will lead a team of seven volunteers that will hand out some 5,000 bedkits to 5,000 needy children in Togo, a west African nation bordered by Ghana, Benin and Burkina Faso. A bedkit, which can be purchased with a donation of $35, typically consists of a mosquito net, bedding and a groundsheet or mattress, as well as clothing and school supplies. MacDougald recently made a presentation to students at Upper Thames Elementary School in Mitchell about Sleeping Children Around the World, and they responded by holding a fundraiser that brought in enough to donate 26 bedkits for the Togo trip. 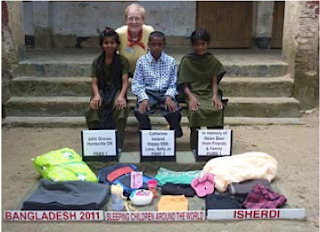 The kits makes a big difference to the children who receive them, said MacDougald, who has already participated in five distributions in places like India and Bangladesh. People often don’t realize how fortunate they are to be born in developed nations until they see the crushing poverty of underdeveloped ones, he suggested. Sleeping Children Around the World is a “100% charity,” which means that every dollar donated to the cause goes to help the children. There is no overhead and volunteers pay their own expenses to travel abroad to distribute the bedkits with the help of overseas volunteers. More information about the charity’s work can be found at www.scaw.org. Where Internet access is available, the team will also post blog entries about the Togo distribution to that site.